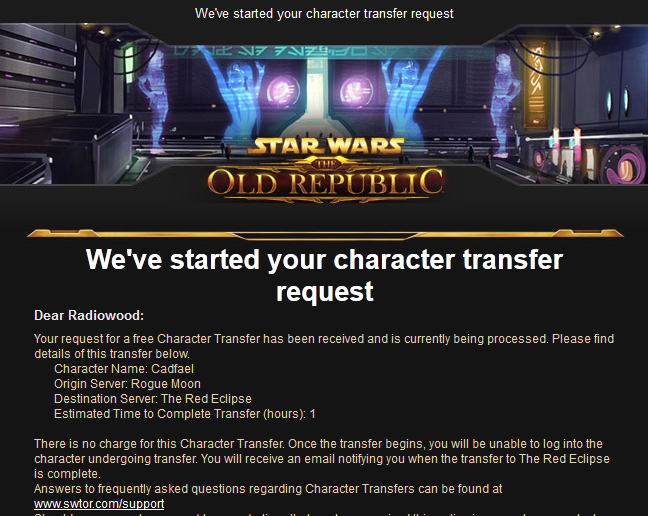 Greetings Radiowood,We are happy to announce that one or more of your characters are available for our Free Character Transfer Service. To begin your character transfer, please sign in to your account hereand select “Character Transfer” from the left-side navigation. If you are in a guild, be sure to coordinate with your guildmates and reform your guild after transferring to the destination server.For questions regarding this service, please visit our Character Transfer page or our FAQs.May the Force be with you! Star Wars the Old Republic is closing servers. They haven’t actually announced that yet, but we are in the midst of a free character transfer service, where the residents of many servers are actively being encouraged to take advantage of a free trip to a much smaller group of servers. This does not bode well for the future of the game, as the next step will be closing down the old servers. This reflects media reports that after the initial peak, players have been leaving the game in large numbers. This is not hard to understand, as there is virtually nothing to do after you reach level 50. The same thing happened in Star Wars Galaxies, but only after several years. In Star Wars the Old Republic it took less than six months! There’s speculation on the forums about what happens if you don’t comply. The best case scenario is that you find yourself on a deserted server (already I must say that on my starting server Rogue Moon the last few times I have logged in there have always been less than 10 other players on the planet, you can almost hear the crickets). At some point the emptied servers will be closed and character transfer will become obligatory. I went through with the procedure, but there were a couple of weaknesses in the process. For one thing, I had two characters on Rogue Moon, but the highly automated transfer system wouldn’t let me move both at the same time. This just wasted a lot of my time as I had to go through the same process twice. More seriously, when I began the transfers, there was a message that in-game mail would not be transferred. This is really stupid. My level 50 character didn’t have any personal e-mails, but there were a whole series of messages from generals, Jedis, lady smugglers, and dukes thanking me for my help along the way. These were kind of fun mementos of my progress in the game, and I see no reason why they had to be removed. So now I am on another server. Perhaps I can now get some help in my latest impossible mission. This entry was posted on June 20, 2012 at 10:33 PM and is filed under Star Wars Galaxies, The Old Republic. You can follow any responses to this entry through the RSS 2.0 feed. You can leave a response, or trackback from your own site.